Lately I’ve been doing A LOT of traveling. In May, I was in St. Tropez, France, shooting for GirlSpanksGirl.com and other spanking sites. On the airplane to France with (L to R) Veronica Ricci, Missy Rhode, Nikki Rouge, Koko Kitten, and Snow Mercy. Then in June, I was a guest Domme at The Studio in Chicago. 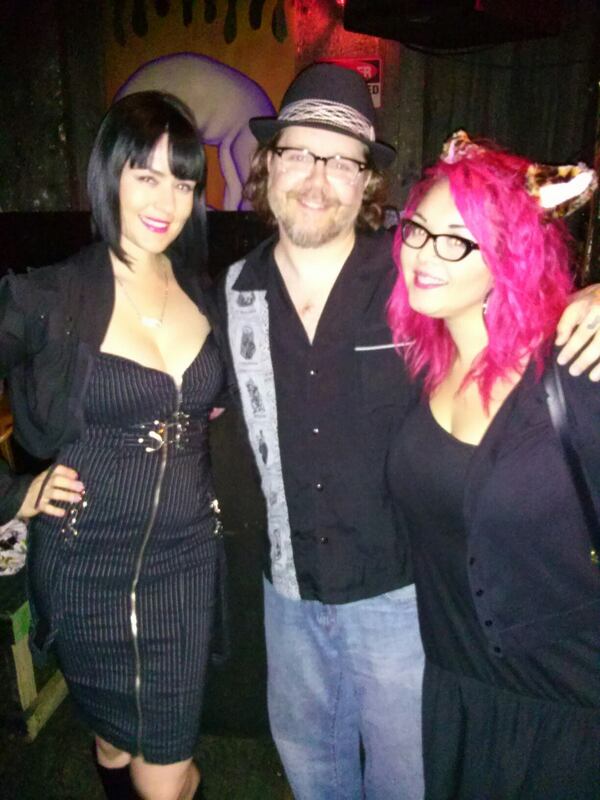 Snow Mercy, Ken Melvoin-Berg, and Sunny Eeklipse Lollipop-Megatron, owners of The Studio in Chicago. Shortly thereafter I went on a much needed two-city vacation to Desert Hot Springs and Las Vegas. I’m back in Los Angeles for now. I leave for ComicCon San Diego on Thursday, July 18th, and return July 22nd. There’s talk of another trip in August. Stay tuned. I had so much fun in Chicago that I’m thinking of planning another trip for the beginning of September. If you are interested in seeing me please send an email to snow@snowmercy.com. Also, I’m putting it out there: I’d love to visit London sometime. If you are interested in helping me make this happen please let me know! So what’s on the horizon other than more traveling. Well, I am team captain for a Bowling For Boobies team. The event is held Oct. 6th in Studio City. If you’d like to donate to my page please do! I’m a speaker at The Death Salon L.A. My talk is on “fetishizing the female corpse” and is scheduled for Friday, Oct. 18th, in Hollywood. And on Saturday, November 16th, I am teaching a workshop on spanking at Stockroom in Los Angeles. Registration will open soon. Snow Mercy and Nikki Nefarious at Stockroom University. Yes, keeping busy as usual. Of course I didn’t include everything I’ve been up to. That’s why you should follow me on Twitter and Facebook. Also be sure to check my schedule at The Dominion so you can see me while I’m in Los Angeles. Can’t make it to the Dominion or you don’t see me scheduled during your preferred times? Then call me on Nite Flirt! 491 Responses to Where or where….? iqqMzu You have noted very interesting details ! ps decent site. I am going to a special place when I die, but I want to make sure my life is special while I am here. by Payne Stewart. Avakin Life is free to play and it’s free to download. being able to now offer my customers the option of moving LTL with us. Yes! Finally someone writes about bag. May I simply say what a relief to uncover an individual who truly knows what they are talking about on the web. You definitely understand how to bring an issue to light and make it important. More people must read this and understand this side of the story. I was surprised you are not more popular since you surely possess the gift.